Want a yummy breakfast and a family activity that brings a pop of color to your summer day? 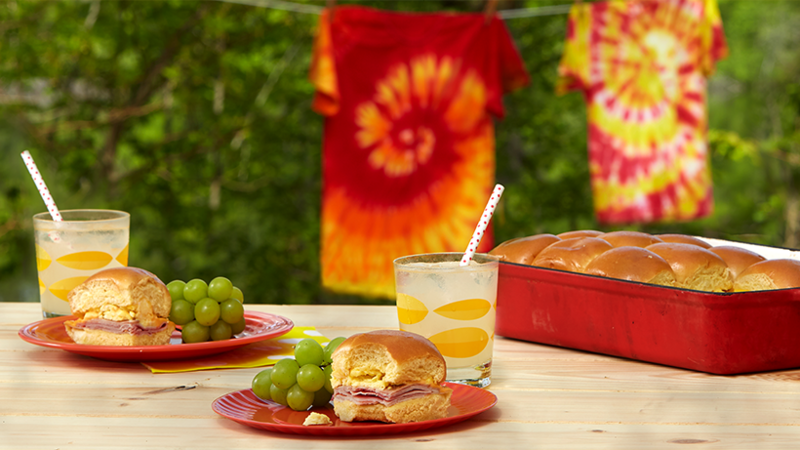 Try these Gwaltney Ham Breakfast Sliders and tie-dye shirts. Cut the sandwich sheet in half through the middle to create two “slices” of sandwich sheet. You want the individual buns to stay together. Prepare a frying pan over medium heat with a tablespoon of your choice butter or cooking oil. While pan heats, crack eggs into a medium-size bowl and whisk until fully blended. Pour into the preheated frying pan and stir constantly until eggs are thoroughly cooked. Place an even layer of the Gwaltney Ham on top of the bread. Follow with the eggs, then the cheese. Top with the sandwich sheet, then pour the butter evenly over the sandwiches. Wash the shirts in the washer. Do not throw shirts into the dryer; leave them wet. The easiest tie-dye method is to accordion-fold the shirt (horizontal or vertical – doesn’t matter), then tie several rubber bands down the length of the folded shirt. Place shirts onto puppy pads to absorb the extra dye. To protect your clothes, use a garbage bag as a smock by cutting a hole at the top (head) and sides (arms). In each squeeze bottle, prepare a ratio of 1:3 dye to water, then let the kids squeeze out dye onto their (still damp) shirts. After squeezing the dye on, let them sit for about an hour. Then put on gloves and rinse out the shirts with water. Once the water runs clear, let the kids help take off the rubber bands, then watch their reactions to their own art creations.